Last year at the beginning of June 2014 I wrote a short note on our unscientific observations on the electric car population in Los Altos. "We walk regularly around Los Altos at the weekends. Usually for 3 or 4 miles, at a leisurely pace, so we are out for around and hour and a half. About three years ago, we started counting cars, to compare the frequency of Honda Fits with Ford Focuses. Teslas started to show up, so they were counted too. For comparison, Nissan Leafs were added. At this point, we've been doing this enough that anecdote starts to approach data. Yesterday we saw 6 Teslas, 3 Fits, 1 Leaf and 1 Focus. It has become routine to see more Teslas than Fits." 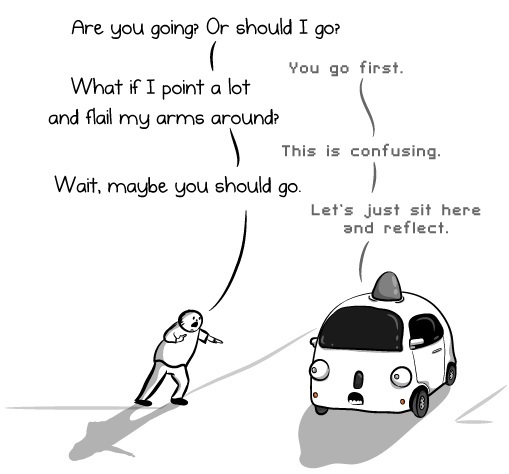 This year we have also seen many more Google cars - and as the Oatmeal says, they are programmed to act like nervous student drivers. The density is high - we see several in an hour. They are the Lexus based model, though we are watching for the little ones as described by the Oatmeal's test drive.